Those with young kids will especially appreciate that some FedGov flunkie will be able to see your child's naked body in full (and easily converted full color) glory. And remember, the Feds says they don't store the images, except, apparently, when they do. Your government, "hard" at work. Now, it seems, literally. When motivational speakers start warning of impending collapse and gloom and doom, you know things are bad. You can read more detail at the Economic Collapse blog post here. After the Senate passed that $600 million Border Security Bill yesterday, President Obama issued a statement asserting that securing the southwest border has been "a top priority" since he took office. But if you think Mr. Obama can have but a single "top priority," you'd be wrong. He's got a load of them. In an Address to the Nation two months ago, Mr. Obama declared "our top priority is to recover and rebuild from a recession that has touched the lives of nearly every American." More than any other issue, he has used the phrase "top priority" about digging the economy out of the recession and creating jobs. And on this issue, he drew a distinction between "a" top priority and "the" top priority. "Creating jobs in the United States and ensuring a return to sustainable economic growth is the top priority for my Administration," he said in an Executive Order last March on his National Export Initiative. Read even more (Yes We Can!) of ObamBam's "top priorities" here. Remember, to our Dear Leader, you're Number One. You've all heard of NYC Mayor Bloomberg and Boston Mayor Menino's unholy group Mayors Against Illegal Guns. Now we have Gun Owners Against Illegal Mayors. Go take a look at the caliber (pun intended) of some of the Bloomberg / Menino group's esteemed membership. Greece: "Things are starting to simmer here ..."
... "Everything is getting more expensive, I'm hardly earning any money, and then I'm supposed to pay more taxes to help save the country? How is that supposed to work?" asks Nikos Meletis, the shipbuilder. His friends, gathered in a small cafeteria on the pier in Perama, are gradually growing more vocal. They are all unemployed, desperate and angry at the politicians who got them into this mess. There is no sympathy here for any of the political parties and no longer any for the unions either. "They only organize strikes to serve their own interests!" shouts one man, whose name is Panayiotis Peretridis. "The only thing that interests me anymore is my daily wage. A loaf of bread is my political party. I want to help my country -- give me work and I'll pay taxes! But our honor as first-class skilled workers, as heads of families, as Greeks, is being dragged through the dirt!" "If you take away my family's bread, I'll take you down -- the government needs to know that," Meletis says. "And don't call us anarchists if that happens! We're heads of our families and we're desperate." He predicts the situation will only become more heated. "Things are starting to simmer here," he says. "And at some point they're going to explode." See the rest on Tom's site at the link above. You can download a U.S. version sized for Avery 5160 labels here. 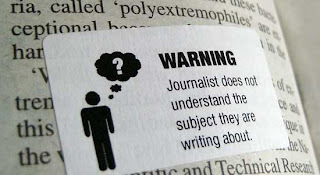 AP Propaganda Corps provides Journolistas with guidelines on Ground Zero Mosque "reporting"
1. We should continue to avoid the phrase “ground zero mosque” or “mosque at ground zero” on all platforms. (We’ve very rarely used this wording, except in slugs, though we sometimes see other news sources using the term.) The site of the proposed Islamic center and mosque is not at ground zero, but two blocks away in a busy commercial area. We should continue to say it’s “near” ground zero, or two blocks away. Read the rest at either of the links above. Gotta make sure any rogue news reporters conform to the News Collective's "standards", er, propaganda mission. It's not the "Ground Zero Mosque", it's merely the "NYC Mosque". 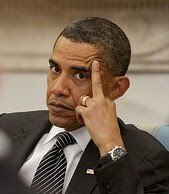 Helpfully, the Propaganda Corps guidance also includes a summary of Dear Leader Obama's position on the mosque. One wonders why we need reporters distributed in the field at all -- the Propaganda Corps / Ministry of Truth Headquarters could simply write the story for them. That way there's no chance that any wayward dissenting opinions might sneak in and muck up the official party line. No, there will be no double dip. It will be a lot worse. The world economy will soon go into an accelerated and precipitous decline which will make the 2007 to early 2009 downturn seem like a walk in the park. The world financial system has temporarily been on life support by trillions of printed dollars that governments call money. But the effect of this massive money printing is ephemeral since it is not possible to save a world economy built on worthless paper by creating more of the same. Nevertheless, governments will continue to print since this is the only remedy they know. Therefore, we are soon likely to enter a phase of money printing of a magnitude that the world has never experienced. But this will not save the Western World which is likely to go in to a decline lasting at least 20 years but most probably a lot longer. ... Once upon a time, the American people worked feverishly to construct beautiful, shining communities from coast to coast. But now we get to watch those communities literally crumble and decay in slow motion. Nothing lasts forever, but for those of us who truly love America it is an incredibly sad thing to witness what is now happening to the great nation that our forefathers built. 1 - Due to extreme budget cuts, school systems across the United States are requiring their students to bring more supplies with them than ever this year. In Moody, Alabama elementary school students are being told to bring paper towels, garbage bags and liquid soap with them to school. At Pauoa Elementary School in Honolulu, Hawaii all students are being required to show up with a four-pack of toilet paper. 2 - According to the American Association of School Administrators, 48 percent of all U.S. school districts are reporting budget cuts of 10 percent or less for the upcoming school year, and 30 percent of all U.S. school districts are reporting cuts of 11 to 25 percent. 3 - In Chicago, drastic budget cuts could result in an average class size of 37 students. 4 - The governor of Hawaii has completely shut down that state's schools on Fridays - moving teachers and students to a four day week. Unemployment is still high, growth low, deficits huge. States are cutting out everything from streetlights to paving. Public pensions are exploding everywhere. A class war looms between retirees who want their sweet-heart obligations honored, and strapped, poorer taxpayers who feel about those bloated payouts as they do their underwater mortgages. In a progressive culture, where ads blare hourly about skipping out on credit card debt, shorting the IRS, and walking away from mortgages, did the public employee unions really think they were exempt from a Chrysler-like renegotiation? In the age of Obama, there is no real contractual obligation: everything from paying back bondholders to fixing a BP penalty is, well, “negotiable.” When the money runs out, the law will too. Law? There is no law other than a mandated equality of result. On the Internet recently appeared the pictures of the JournoList bunch, who at least between themselves gave up their usual pretense that the media was unbiased. With all due respect (confession: I was briefly mentioned by the list as someone that the racist card might work on in connection with the illegal immigration debate), they appear to the eye as a sort of nerdish group. Author Ayn Rand has millions of fans around the globe, but only one of them used the globe itself to say so. Nick Newcomen drove 12,328 miles across the United States to "write" a message that can only be seen on Google Earth. 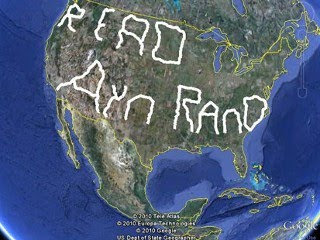 The mega-message "Read Ayn Rand" now stretches from coast to coast, with parts of the letters in 30 states. Read the rest of this sordid tale of woe here. The disaster that is our nation was almost 100 years in the making. Fixing it, assuming it can be fixed, will require concentrated effort and much pain and suffering -- penance for profligacy, and punishment for the irresponsibility of past generations, and our own. This follows an earlier disclosure (PDF) by the TSA that it requires all airport body scanners it purchases to be able to store and transmit images for "testing, training, and evaluation purposes." The agency says, however, that those capabilities are not normally activated when the devices are installed at airports. Read the rest here. It's probably only a matter of time before body scans of the traveling public turn up on the Internet. Give up your privacy, mere subjects. After all, it's "for your own good." Well, not quite. But in the world of state-federal diplomacy, that's the blunt import of Texas' response to the EPA's attempt to impose regulation of greenhouse gases on the states. “On behalf of the state of Texas, we write to inform you that Texas has neither the authority nor the intention of interpreting, ignoring, or amending its laws in order to compel the permitting of greenhouse gas emissions. Read the actual Texas response letter here. Texas uses really strong language to express its disapproval of EPA's actions. Another reason to like Texas. Basically, Texas asserts that the EPA is trying to do an end run around federal law and its own regulations to regulate greenhouse gases, and is trying to bully the states into accepting the EPA's position. Let's hope other states also tell the FedGov to shove it. The vuvuzela (pronunciation: /vuːvuːˈzɛlə/), also known as lepatata (its Tswana name), is typically a 65-centimetre (2 ft) plastic device that requires the flow of air to produce a loud monotone note, typically around B♭3 (the B♭ below middle C). A similar device, known as the corneta, is used in Brazil and other Latin American countries. Many types of vuvuzela, made by several manufacturers, may produce varying intensity and frequency outputs. The intensity of these outputs depends on the blowing technique and pressure exerted. Look, up in the sky, it's a ... car? California Congressman: "The federal government can do most anything in this country." A non-Newtonian fluid is a fluid whose flow properties are not described by a single constant value of viscosity. Many polymer solutions and molten polymers are non-Newtonian fluids, as are many commonly found substances such as ketchup, starch suspensions, paint, blood and shampoo. In a Newtonian fluid, the relation between the shear stress and the strain rate is linear (and if one were to plot this relationship, it would pass through the origin), the constant of proportionality being the coefficient of viscosity. In a non-Newtonian fluid, the relation between the shear stress and the strain rate is nonlinear, and can even be time-dependent. Therefore a constant coefficient of viscosity cannot be defined.